← The Sports Archives – The Ashes – A Whole Lotta’ History! The Sports Archives – Facts You Never Knew About The Australian Open Tennis Grand Slam Tournament! The world’s best tennis players gather in Australia in January every year in order to play the first Grand Slam tournament of the year. The tournament is played in mid-summer in Australia and will certainly test the players to see how well their training has gone, as the last Grand Slam, the U.S. Open, will typically be played during the September beforehand. This post will introduce you to some facts about the Australian Open, covering the history, the conditions, the players and the all important statistics. The tournament was first introduced in 1905, although it was originally known as the Australian Championships. It didn’t take on its new name, the Australian Open, until 1969. The tournament is now played in Melbourne and has been since 1972, although previously it was played in a number of different Australian cities. The Australian Open has the distinction of actually being played in a completely different country, as the 1906 and 1912 tournaments were played in New Zealand. As mentioned, the tournament is played during the Australian summer and the temperature regular reaches over 40 degrees Celsius, and this is well in excess of 100 degrees Fahrenheit. The 2007 tournament saw such unbelievably high temperatures that many players had to be put on intravenous drips. The tournament now has an Extreme Heat Policy (EHP) and the umpires have the ability to suspend play if they believe the temperature is dangerously high. Retractable roofs have now also been added to many of the courts in an attempt to conquer the extreme heat. The temperature can be that extreme that the tennis balls have been known to shrink or expand, thus meaning that they often react in a different way when they come into contact with the actual court and tennis racquets. Amazingly the youngest and oldest ever winner of the men’s Australian Open is the same person, Ken Rosewall. He won the tournament at the age of 18 in 1953 and also at the age of 37 in 1972. The youngest women’s winner of the Australian Open is Martina Hingis who became champion in 1997 at the tender age of 16. 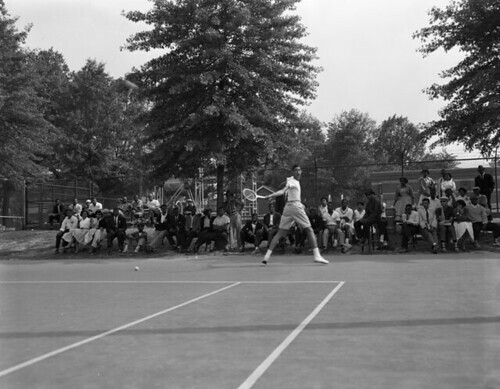 Prior to the open era being introduced in 1969 (a year later than the other 3 Grand Slams), Roy Emerson won the tournament a record 6 times. Since the inception of the open era, which is when the tournament was opened to professionals, three players, Andre Agassi, Roger Federer and Novak Djokovic, have all won the tournament 4 times. Margaret Court has won the tournament a total of 11 times, but only 4 times since the open era. Serena Williams can boast 5 titles since the open era began. It is estimated that over 40,000 Wilson tennis balls are used every year at the tournament. Over 160,000 ice creams and 37,000 BBQ sausages are consumed by spectators on a yearly basis. Over half a million spectators attend the tournament annually with 2007 seeing a record 554,858 spectators. There are typically over 300 ball boys and ball girls in attendance every year. Today’s featured writer, Lourdes Sanchez, is a part of the team at Tennis Coaching, retailers of tennis shoes. When not on the tennis courts, she uses her spare time to volunteer at the local homeless shelter. Great moments at the Australian Open! Volley for Serve Down Under! A Sports Fan’s Guide to Melbourne! This entry was posted in Tennis and tagged Andre Agassi, Australian Championships, Australian Open, Extreme Heat Policy (EHP), Fun Facts, grand slam, history, Ken Rosewal, Margaret Court, Martina Hingis, melbourne, New Zealand, Novak Djokovic, roger federer, Roy Emerson, Serena Williams, sports and leisure, sports and recreation, Sports Archives, Sports Blogs, tennis, tennis blogs, tennis news, tennis tournaments, U.S Open, Wilson tennis balls. Bookmark the permalink.